I pawed through some archives and managed to fill the collage out a bit more. I’ve added years 1999, 2000, 2001, 2003 and 2004. In addition, I’ve added the year to each image to make it a bit more viewer friendly. Some of these are not “actual” self portraits…in that, they may have been done for a strip or an illustration… but the evolution still holds. To me, these images are more telling than photos. Sure, a photo can convey some emotion, but a photo can’t tell me about line. For example: 1999. The lines used on that portrait are pretty uniform. There is some hatching in the hair and beard but for the most part the lines are tentative. There is nothing that I was sure about in drawing that. In fact, maybe by not getting into detail, I was hiding something. What that something may have been isn’t too clear. 2000 finds me confused. Am I supposed to be doing this? 2001 makes it seem as though I was happy… if only for a brief moment. I’m not absolutely certain of when in 2001 this was drawn, but it’s a same bet to assume it was before September. Between 2005 and 2008 and possibly into 2009 I’m trying to figure out who I was not only as a person but as an artist. Am I supposed to be a cartoonist or so I want to be a “fine artist”? This was the period where I was living in a tight rope… my marriage was starting and ending, life changed for me… grad school and a new life. New life means a new face and int he process, trying to figure out what the old face was. By 2010, with an MFA on my wall, I had myself all figured out. Sort of. Wonder what the next 20 will look like. I will try and fill the gaps in this collage as I find them. 1993, 1996-1998 and 2002. I’ve made no secret of my desire to be an astronaut…or at least my desire to wear a spacesuit all the time. Chris Hadfield, outgoing commander on the International Space Station is who I’d want to be like if I were an actual astronaut. The things that he has done to raise awareness of the importance (and fun) of space exploration rank at the top of the list of coolest things ever. throughout high school and undergrad, i couldn’t be bothered with history. it just never really clicked with me: why would you want to look at things that have already happened? that last statement is bordering on ironic considering that at one point i wanted to be a philosophy major. as i got older i started to understand history more…not the dates and the places but the CONCEPT of history. it was simple: knowing what was done directs what you’re going to do. okay, i get that… as i got deeper and deeper though, i realized that history puts only a few names in bold print: washington, jefferson, adams… but they’re not the only ones making history. in fact, history; the creation of a nation, an economic entity, is all about the names that you never hear…names and faces that in some cases are never even recorded. what excited me the most was that history is all about stories. i get more perspective from a corporal in a muddy field who jotted notes in his journal than his commanding general in a dry tent on a hill. it’s about the faceless, nameless masses. they’re the ones that make history real. maybe one of these days i’ll work on my phd. for now, i’ll let a cartoon squirrel let me know how blind i can sometimes be. I’ve been experimenting with brush and ink lately. 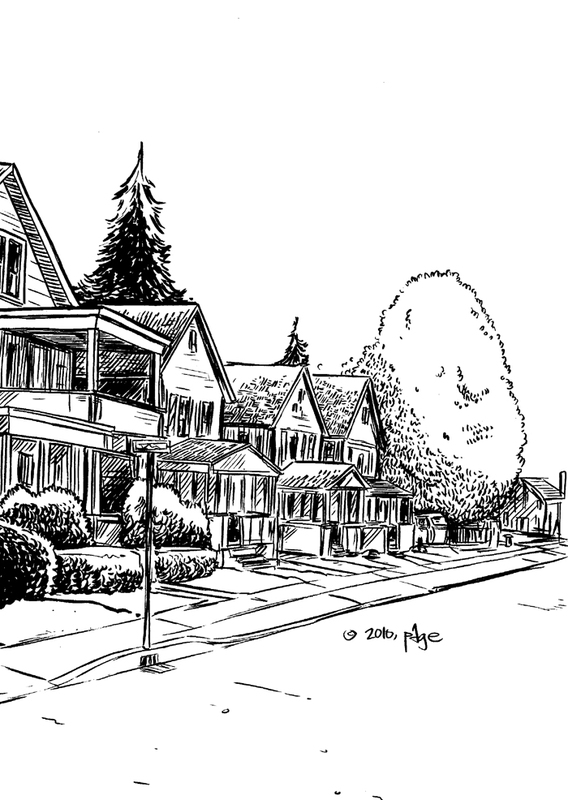 I did this little rendering for a graphic novel in the works for my MFA studies…I drew out the houses but didn’t have a clue as to how i would do the brushwork. It just happened. Sure, before this drawing there have been thousands…so I had that experience, but past is past. It’s not perfect, but as it was taking shape I could hear Bruce Springsteen’s “My Hometown” playing in my head. In my sophomore year of undergraduate study, I took a class called Introduction to Cinema. It was an upper level art history course – at a point when I was trying to figure out if art was something I really wanted to go into. One of the first movies we examined was Orson Welles’ 1941 masterpiece Citizen Kane. Even though I was a huge fan of early motion picture history (silent comedies especially) I had never seen Kane. Before the screening the professor, Dr. Arthur Lennig, spent an hour lecturing about Welles’ eye, his technique, the story, and his groundbreaking innovations—everything a good professor should do. He even told us about the time he met and spoke to Mr. Welles. Once the lecture was over, the movie was screened. At the time, I didn’t fully understand why I felt that way. Citizen Kane is a masterpiece! What was wrong with me? Later on, I saw that Dr. Lennig’s lecture pointed out how the magician did his tricks. I wasn’t watching the movie, I was looking at the dessert cart while chewing on a fine dinner I didn’t taste. I’ve since developed an appreciation for Citizen Kane but wondered what my experience would’ve been like had I not gotten that lecture. This is why I HATE over analyzing my work. I want the magic every once in a while. I don’t want to know where the rabbit comes from or if that playing card is up a sleeve. I just want to enjoy the trick. It’s good to know technique, but he magic has to stay magic.